Allan Katz, a scholar and a gentleman. 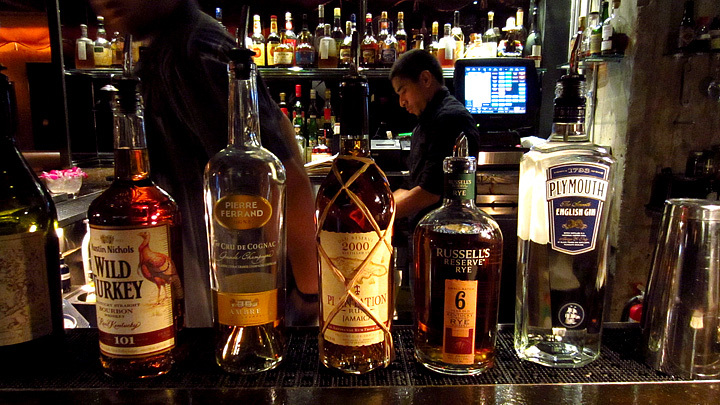 Last week, a special dual celebration took place at Caña Rum Bar: World Cocktail Day and Thirsty in LA’s Two-Year Blogiversary. Thanks to the efforts of Caña GM Allan Katz, it was also a fundraiser for the Museum of the American Cocktail, one of a handful of officially sanctioned events that took place around the world. 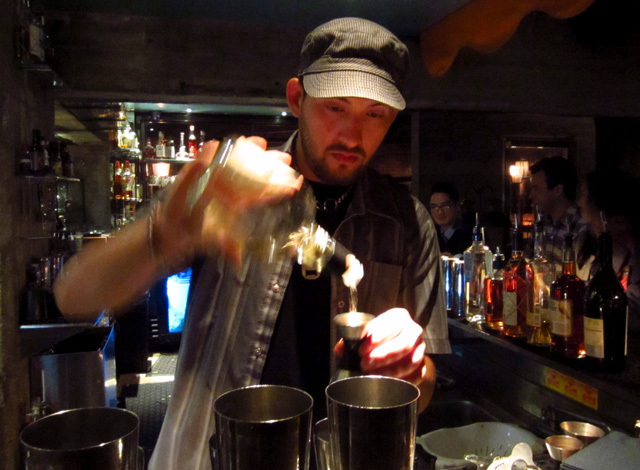 Katz and bartender Danielle Crouch were behind the stick, so we were in good hands on a fun and memorable night. Each cocktail on the History Menu featured one or more of our sponsors. In honor of World Cocktail Day, Katz created an exclusive History Menu of classic cocktails, each one featuring one (or more) of our sponsors. I started the festivities with a Quaker, a delicious sour made with Pierre Ferrand Cognac, Russell’s Reserve Rye, pomegranate and lemon. The Quaker was included in The Artistry of Mixing Drinks by the legendary Frank Meier, bartender at the Hôtel Ritz Paris from 1921 to 1947. Sir Winston Churchill, Sir Noël Coward, Teddy Roosevelt, F. Scott Fitzgerald and Cole Porter were among those who enjoyed Meier’s cocktails, so I was in pretty good company. I SHOULD THIRST WHILE ALL THESE DRINK? 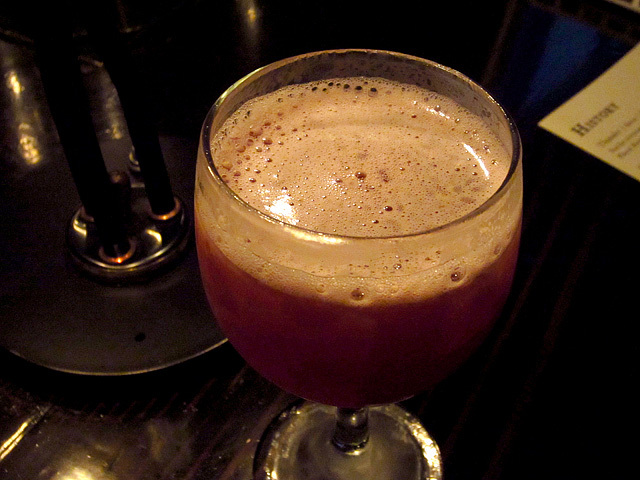 My friend Amy went with a drink from The Savoy Cocktail Book, the Thunder: Pierre Ferrand Ambre, an organic brown egg, dashes of sugar and cayenne. 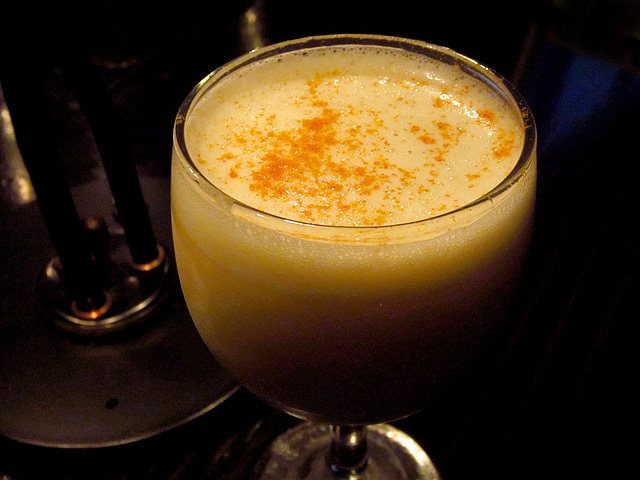 The Thunder was rich and spicy, essentially a brandy flip topped with a dusting of cayenne pepper. With Caroline on Crack, e*star LA and Elina Shatkin (Squid Ink) in the house it was like a mini-Blogger Bar Hop reunion, minus the Trolley of Death. And speaking of death, no one attempted to break the 28 Days Later speed drinking record that night, a time that currently stands at 6.1 seconds. Caroline and Esther considered taking on the challenge, but wisely thought better of it and slowly sipped cocktails from Caña’s History and regular menus. 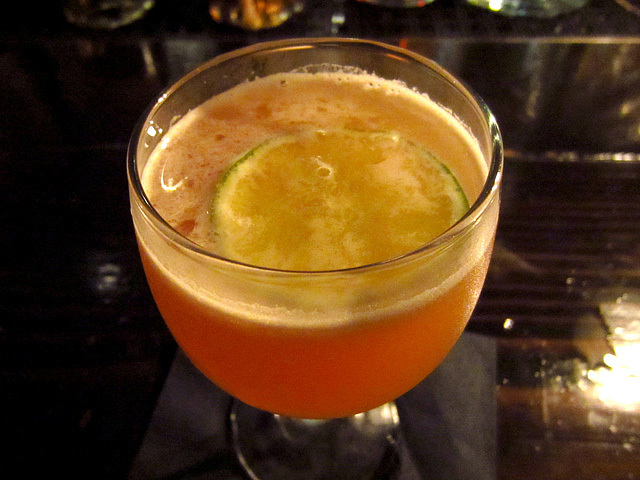 Some of my friends were making their first visit to Caña, including Toshi, who ordered the Captain’s Blood, from David A. Embury’s The Fine Art of Mixing Drinks: Plantation Jamaica 2000, lime, turbinado sugar and bitters. It's about to get Zwacky at Caña! Ever the instigator, Lush Angeles ordered a round of Zwack, “The National Shot of Hungary.” Thankfully we did our shots straight up, and not dropped into an energy drink (aka a “Mad Hungarian”), which is always a possibility when Ron’s involved. 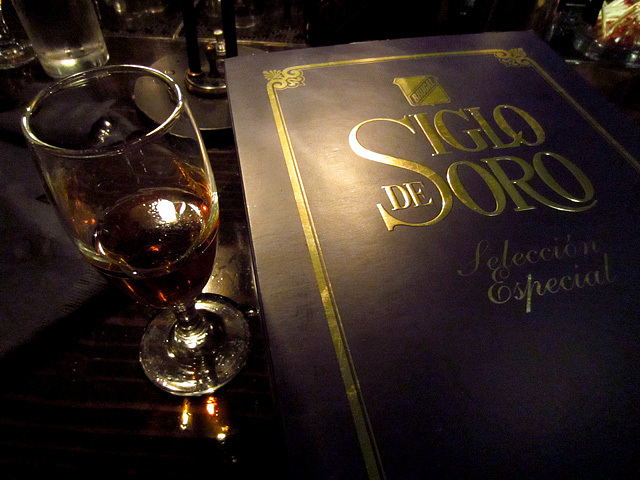 The rare and sublime Brugal Siglo de Oro. LA Cocktails Examiner Aaron Vanek (another Death Trolley passenger) and his wife Kirsten joined us as well. Caña happened to be one of Aaron’s stops on his birthday bar crawl, scheduled for the next night. He brought a rare bottle of Brugal Siglo de Oro for Caña to hold until his b-day bash, and he graciously broke the seal early and shared a few tastes. In his 2007 review, RumDood awarded the Siglo de Oro a perfect 5 out of 5 rum bottles, and knowing that it’s no longer produced made each sip of the sublime Brugal that much better. 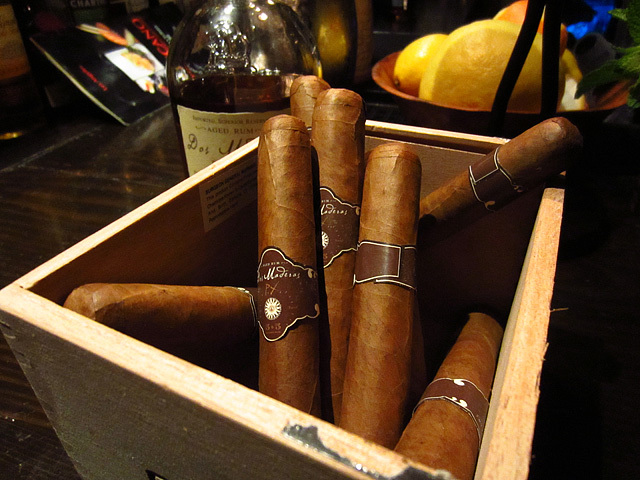 To follow up this deliciousness, Katz set us up with cigars and tasting glasses of the Dos Maderas 5+3 Caribbean Aged Rum. The 5+3 is so named because it’s first aged for 5 years in oak casks in Guyana and Barbados, then for an additional 3 years in sherry casks in Spain. When people ask why I love going to Caña, I can point them to this memory: kicking back on the patio with a great group of friends, puffing on a cigar and sipping the velvety smooth 5+3, rich with vanilla and caramel. 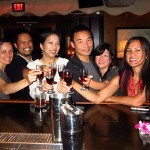 Whether bartender or imbiber; shaker or typer, let us each toast the spirit of the world’s greatest fighters, the men and the women dedicated to making souls brighter. So let’s raise ‘em high and make this an all-nighter! 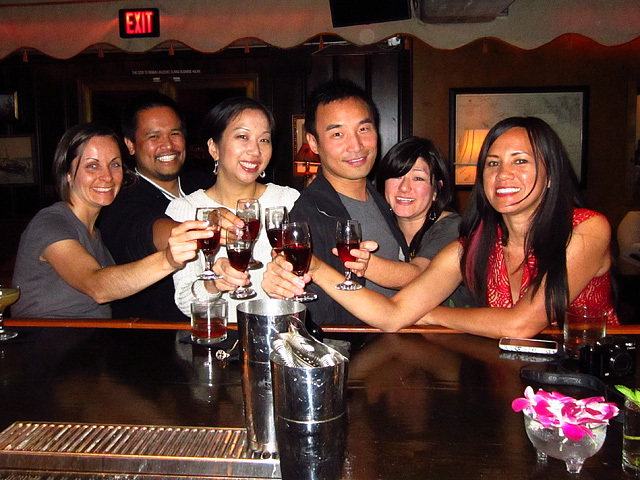 Cheers to everyone for coming out to help me celebrate and for donating to MOTAC! My eternal gratitude to Allan Katz for going way beyond the call of duty in making this night possible. And of course, many thanks to our generous sponsors: Pierre Ferrand Cognac, Plantation Rum, Plymouth Gin and Wild Turkey.